The Outlaws had been conspicuous by their absence from LaSalle Speedway in Illinois for 3 years. The quarter-mile high-banked track patiently awaited their return. When they came back they did not disappoint. There was a new winner in victory lane for the eighth time in as many visits to the fast bull ring. This time it was Tim Kaeding, and he came all the way from California to tame the high banks. The 32-car field of winged sprints hit the track with great expectations. The track record was 10.368 seconds and was set by Brandon Wimmer in June of 2004. Even in hot laps it became apparent that record was in jeopardy. It fell for the first time with the 11th car out of the gate, when current reigning champion Donny Schatz turned a lap of 10.335 seconds. It would fall again with the 24th car out, when Paul McMahan turned a lap of 10.330 seconds. The top five qualifiers on the night were within .116-seconds of each other. Daryn Pittman, Jason Sides and Brian Paulus rounded out the top five qualifiers. The first of four heat races was won by Kerry Madsen with Sammy Swindell in hot pursuit. Paul McMahan, Paul Ninehiser and Cody Darrah all transferred to the A Main. Darrah would take the spot at the line from Brian Paulus. Madsen, Swindell and McMahan would all transfer to the dash. The second heat race was won by the King of the Outlaws, Steve Kinser, with Bill Balog right on his heels and teammate Donny Schatz all over his. Kraig Kinser and Jason Solwold rounded out the transfers to the A Main. Balog and Schatz got together early in the race and bang wheels with both able to continue on without a yellow. Steve Kinser, Bill Balog and Donny Schatz transferred to the Dash. The third heat race was won by Tim Kaeding with Craig Dollansky nipping at his tail tank. Joey Saldana, Daryn Pittman and Kody Kinser also transferred to the A, with Kaeding and Dollanksy going to the Dash. The final heat of the night was won by Australian champion and the winningest Sprint Car driver in the world right now, James McFadden. David Gravel came home second followed by Jason Sides, Chad Kemenah and A.J. Bruns. McFadden and Gravel transferred to the Dash. McFadden was running his first Sprint Car race of the season in the United States after finishing up the Australian championship. The Dash Inversion was a six, putting McFadden on the pole with Tim Kaeding to his outside. But it didn’t stay that way for long. Kaeding quickly jumped to the lead and never looked back. The first scary moment of the night came when Steve Kinser jumped the berm on the inside of the track and drove through the infield, sliding back up on the track on the other side and barely missing David Gravel and Craig Dollansky. With the skills of the King, he righted the car and avoided hitting the wall, finishing on the lead lap in 10th spot. The Last Chance Showdown was a battle royal between Wayne Johnson and Brian Paulus, and Jordon Goldesberry and Ben Wagoner. Goldesberry secured the final transfer on the front stretch after losing it on the back stretch of the final lap. Johnson and Paulus battled back and forth for the victory with Johnson holding off Paulus by a car length. The A Main took four tries to get started. Three laps in, Daryn Pittman and Wayne Johnson had scary moment number two, when they got together coming out of four and both flipped down the front straightaway in what closely resembled synchronized flipping. The top wing of Pittman’s car looked to be torn in a couple of places and the front axle was broken, but the Kasey Kahne Racing team called it to the work area rather than to the trailer. With the open red flag period that came at the same time, the Great Clips team was able to make the repairs and return Pittman to the track to finish the race. Johnson was done for the night with significant rear end damage. From that point on the A Main was a fast-paced, hold-your-breath race full of slide jobs and cunning tactics by some of the best the world has to offer. Donny Schatz closed on Tim Kaeding in traffic. He even edged up in front of him but he couldn’t hold the position. Kaeding was just too strong. It was his night to win. The two incredible performances of the night came from points leader Daryn Pittman who, after his team pulled off the feat of the night getting the Great Clips number 9 back out for the restart, came from dead last on the field to 14th. The run saved Pittman a great deal in the points: Schatz was able to cut the lead to just 109 markers but it could have been cut to less than 50. The courage that it took for Pittman to crawl back in that car after flipping it five times down the frontstretch with each impact harder than the last is immense. If there was ever any doubt that Daryn Pittman is an Outlaw, it is gone now. He earned his medal tonight. And he did it in an impressive and hard charging fashion. The second incredible performance was that of Steve Kinser, who finished the last two laps of the race with a flat rear tire. He held on to 10th spot and he never, not one time, lost control of the car. Realize that these guys were doing 100 + mph out there on the dirt: to drive a car with a flat tire competitively at 100 mph is no joke. As a matter of fact, it is almost the stuff that super heroes are made of. But the fact is that Steve Kinser is not a super hero. He is a brick layer and a common man whose God-given skills and talents are driving a race car on dirt. We are blessed to be able to watch him work his magic. The Outlaws cars all sighed and yawned. It had been a long night. They were ready for their baths and then the trailer. They had a long trip ahead of them and they were all taking the green tomorrow night. It was a good night all in all. Everyone’s driver was safe and going home to their loved ones to make the trip to Wisconsin tonight. It was the second stop of the weekend. There was still a third looming ahead this weekend. But when the gates dropped tomorrow they would be ready to carry their drivers as fast and as far as together they could go. Qualifying: 1. 51-Paul McMahan, 10.330; 2. 15-Donny Schatz, 10.335; 3. 9-Daryn Pittman, 10.352; 4. 7S-Jason Sides, 10.425; 5. 28-Brian Paulus, 10.446; 6. 11K-Kraig Kinser, 10.447; 7. 71M-Joey Saldana, 10.467; 8. 63-Chad Kemenah, 10.501; 9. 1-Sammy Swindell, 10.535; 10. 11-Steve Kinser, 10.565; 11. 83-Tim Kaeding, 10.586; 12. 55X-James McFadden, 10.596; 13. 29-Kerry Madsen, 10.623; 14. 17B-Bill Balog, 10.663; 15. 7-Craig Dollansky, 10.709; 16. 6-David Gravel, 10.717; 17. 4-Cody Darrah, 10.723; 18. 77X-Wayne Johnson, 10.740; 19. 4M-Kody Kinser, 10.740; 20. 44-A.J. Bruns, 10.752; 21. 9X-Paul Nienhiser, 10.785; 22. 82-Jason Solwold, 10.818; 23. 84-Ben Wagoner, 10.883; 24. 6R-Bill Rose, 10.888; 25. 65-Jordon Goldesberry, 10.993; 26. 52F-Logan Faucon, 11.006; 27. 4K-Kris Spitz, 11.007; 28. 8A-Nick Alden, 11.103; 29. 5H-Patrick Haynes, 11.144; 30. 79-Blake Nimee, 11.192; 31. 10V-Matt Vandervere, 11.221; 32. 10T-Tim Moore, 11.681. Heat 1 - (10 Laps - Top 5 finishers transfer to the A-feature): 1. 29-Kerry Madsen ; 2. 1-Sammy Swindell ; 3. 51-Paul McMahan ; 4. 9X-Paul Nienhiser ; 5. 4-Cody Darrah ; 6. 28-Brian Paulus ; 7. 65-Jordon Goldesberry ; 8. 5H-Patrick Haynes . Heat 2 - (10 Laps - Top 5 finishers transfer to the A-feature): 1. 11-Steve Kinser ; 2. 17B-Bill Balog ; 3. 15-Donny Schatz ; 4. 11K-Kraig Kinser ; 5. 82-Jason Solwold ; 6. 77X-Wayne Johnson ; 7. 79-Blake Nimee ; 8. 52F-Logan Faucon . Heat 3 - (10 Laps - Top 5 finishers transfer to the A-feature): 1. 83-Tim Kaeding ; 2. 7-Craig Dollansky ; 3. 71M-Joey Saldana ; 4. 9-Daryn Pittman ; 5. 4M-Kody Kinser ; 6. 84-Ben Wagoner ; 7. 4K-Kris Spitz ; 8. 10V-Matt Vandervere . Heat 4 - (10 Laps - Top 5 finishers transfer to the A-feature): 1. 55X-James McFadden ; 2. 6-David Gravel ; 3. 7S-Jason Sides ; 4. 63-Chad Kemenah ; 5. 44-A.J. Bruns ; 6. 6R-Bill Rose ; 7. 8A-Nick Alden ; 8. 10T-Tim Moore . Dash - (6 Laps, finishing order determined first 10 starting positions of A-feature): 1. 83-Tim Kaeding ; 2. 55X-James McFadden ; 3. 51-Paul McMahan ; 4. 1-Sammy Swindell ; 5. 15-Donny Schatz ; 6. 29-Kerry Madsen ; 7. 6-David Gravel ; 8. 7-Craig Dollansky ; 9. 17B-Bill Balog ; 10. 11-Steve Kinser . Last Chance Showdown - (12 Laps - Top 4 finishers transfer to the A-feature): 1. 77X-Wayne Johnson  [-]; 2. 28-Brian Paulus  [-]; 3. 6R-Bill Rose  [-]; 4. 65-Jordon Goldesberry  [-]; 5. 84-Ben Wagoner  [$200]; 6. 8A-Nick Alden  [$180]; 7. 52F-Logan Faucon  [$175]; 8. 4K-Kris Spitz  [$160]; 9. 79-Blake Nimee  [$150]; 10. 5H-Patrick Haynes  [$150]; 11. 10T-Tim Moore  [$150]; 12. 10V-Matt Vandervere  [$150]. A-Main - (40 Laps): 1. 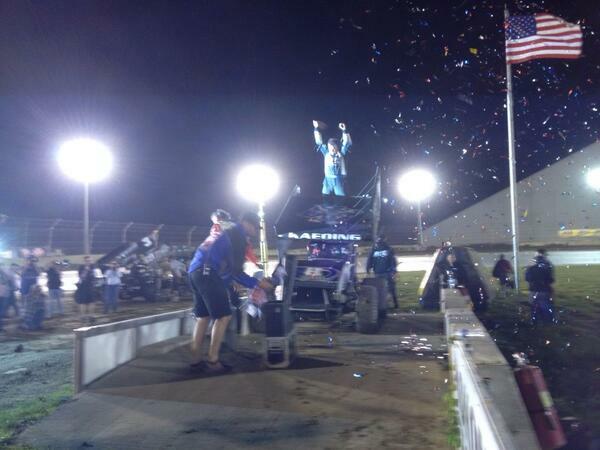 83-Tim Kaeding  [$10,000]; 2. 15-Donny Schatz  [$5,500]; 3. 7-Craig Dollansky  [$3,200]; 4. 51-Paul McMahan  [$2,800]; 5. 17B-Bill Balog  [$2,500]; 6. 1-Sammy Swindell  [$2,300]; 7. 7S-Jason Sides  [$2,200]; 8. 6-David Gravel  [$2,100]; 9. 11K-Kraig Kinser  [$2,050]; 10. 11-Steve Kinser  [$2,000]; 11. 4-Cody Darrah  [$1,500]; 12. 29-Kerry Madsen  [$1,200]; 13. 71M-Joey Saldana  [$1,100]; 14. 9-Daryn Pittman  [$1,050]; 15. 4M-Kody Kinser  [$1,000]; 16. 6R-Bill Rose  [$900]; 17. 44-A.J. Bruns  [$800]; 18. 55X-James McFadden  [$800]; 19. 82-Jason Solwold  [$800]; 20. 77X-Wayne Johnson  [$800]; 21. 9X-Paul Nienhiser  [$800]; 22. 65-Jordon Goldesberry  [$800]; 23. 28-Brian Paulus  [$800]; 24. 63-Chad Kemenah  [$800]. Lap Leaders: Tim Kaeding 1-40. KSE Hard Charger Award: 6R-Bill Rose [+7].